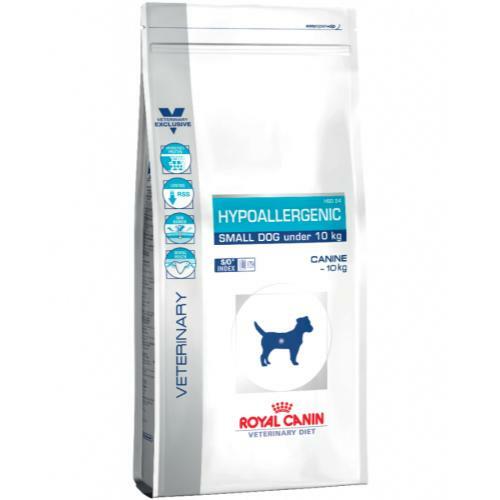 Royal Canin Veterinary Hypoallergenic HSD 24 is a nutritionally complete dog food designed to reduce food intolerances in small dogs. Created especially for adult dogs weighing under 10kg, Hypoallergenic HSD 24 is ideal for use in a food elimination trial for dogs afflicted with food allergies or intolerances, inflammatory bowel disease, chronic diarrhoea, exocrine pancreatic insufficiency or small intestinal bacterial overgrowth. Formulated with select carbohydrates and hydrolysed proteins with a low molecular weight to reduce reactions, Hypoallergenic HSD 24 is a low RSS food that works to reduce ions which contribute to the formation of crystals. With kibbles designed help halt the build up of plaque and tartar, Royal Canin’s bespoke recipe contains nutrients which nourish your dog’s skin from the inside, forming a barrier against the elements. We recommend that you seek an opinion from a veterinarian before beginning this diet, and once your dog has started, it is strongly suggested that they be fed on only Hypoallergenic HSD 24 for 3 to 8 weeks to allow it to take effect. If symptoms clear up, you can persist with this food indefinitely. Please do not feed Hypoallergenic HSD 24 to pregnant or lactating dogs or puppies. Rice, hydrolysed soya protein isolate, animal fats, minerals, hydrolysed poultry liver, soya oil, beet pulp, fructo-oligo-saccharides, fish oil, borage oil, marigold extract (source of lutein). Nutritional additives: Vitamin A: 24900 IU, Vitamin D3: 800 IU, E1 (Iron): 40 mg, E2 (Iodine): 2.8 mg, E4 (Copper): 10 mg, E5 (Manganese): 54 mg, E6 (Zinc): 199 mg - E8 (Selenium): 0.1 mg - Technological additives: Pentasodium triphosphate: 3.5 g - Preservatives - Antioxidants. Protein: 24% - Fat content: 16% - Crude ash: 9.8% - Crude fibres: 0.7% - Essential fatty acids: 43.4 g/kg.